Tendons attach our muscles to our bones. Our muscles move our bones by pulling on our tendons. They move our arms to position our hands for a variety of functions. The Biceps tendon is attached at the front of the shoulder. The Biceps works with other muscles to bend or flex our elbow. The shoulder provides stability when our elbow flexes and as we lift objects. Shoulder impingement syndrome occurs when bone spurs or bursa inflammation narrows the space that is available for the rotator cuff tendons. The tendons can tear as they rub across the bone spur particularly when the arm is elevated. Irritated tendons may develop tendonitis, a painful condition. Often the pain comes from tendon degeneration, similar to the process in tennis elbow. 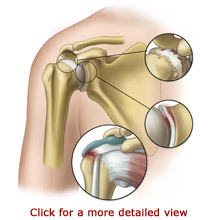 Shoulder impingement syndrome may even cause the tendons to detach from the top of the humerus. Arthroscopic surgery is commonly used to reconstruct ligaments or remove damaged tissue and bone spurs. In some cases, both arthroscopic and open surgery techniques are used. Your doctor will discuss your examination results and help you decide on your course of treatment. 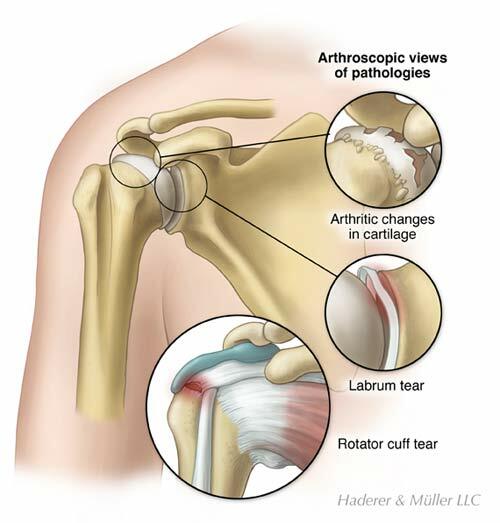 Almost all of arthroscopic shoulder surgeries are performed as outpatient procedures. You will require anesthesia for the surgery. During the surgical treatment, your doctor may make additional small incisions and use other slender surgical instruments. In some cases, a procedure called Thermal Capsulorrhaphy is used to treat tendons and ligaments with heat. Because the surgical incisions are so small, they will require just a stitch or Steri-Strips, and will then be covered with a bandage. Most shoulder conditions can be treated with non-surgical methods. You may receive anti-inflammatory medication or cortisone injections to relieve pain and inflammation. You may be referred to an occupational therapist or a physical therapist for treatment and rehabilitation. The therapists may use modalities, including ultrasound or heat packs, to relieve pain and assist stretching exercises. Restoring range of motion is one of the key treatment goals the therapist will help you with. Your therapist will also teach you exercises to strengthen your muscles. In some cases, non-surgical treatment methods may fail or provide only minimal improvement of symptoms. In such cases, arthroscopy is recommended. If you receive arthroscopic surgery, your surgeon will restrict your arm movements for a short period of time following your procedure. You will most likely wear an arm sling for a short length of time, depending on the procedure performed. An occupational or physical therapist will gently help you move your arm at first with passive range of motion exercises. Arm movements are important for circulation and the health of your muscles, and to prevent stiffness. You will progress to performing arm motions by yourself and then will progress to strengthening exercises. Your therapists will help you improve your endurance and coordination as well. Sport specific exercises will be added, when necessary. A home exercise program is continued beyond the period of formal therapy as improvements continue for many months. It is helpful to exercise to maintain a strong, stable, and flexible shoulder. Avoiding repetitive overhead movements may help to prevent certain conditions from worsening. Further, it is important to follow your doctor’s instructions for any weight lifting or motion restrictions.